From the back cover: Trumpeter Les Elgart was born in New Haven, Conn. He and his brother Larry received musical training early in life, thanks to the influence of their mother, a former concert pianist. When he was still in his teens, Les auditioned for and won a job with the late, great Bunny Berigan. After a war-time hitch in the Navy, he joined Woody Herman's orchestra, and then moved over to the musical staff of the Columbia Broadcasting System. Then, with the idea of a dance orchestra whirling around his head, he resigned and organized his present group, with the idea of contributing to the revitalization of dance music, a difficult chore but one to which the band has contributed more than its share of assistance. The idea for this collection has been germinating for a long time, and did not spring into bloom until tests of the previous Elgart collection had been heard. It began some time ago when George Avakian and Tom Ford were undergraduates at Yale University, and vitally interested in records. One surprising omission they discovered was the complete lack of the kind of music that dance bands played when the lights were being dimmed, the prom was over, and only a few couples were left on the floor, stretching out the last pleasant moments as long as possible, perhaps with their coats already on. Then, like many other good ideas, it settled back into obscurity until, in 1953, Avakian played the first Elgart records for his friends, who promptly reminded him of the "last dance" idea. 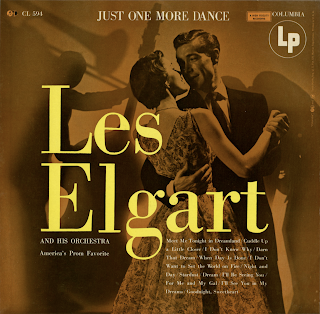 The result is this music by Les Elgart and his orchestra, danceable, sentimental, and keyed to those last memorable moments of a dance date.